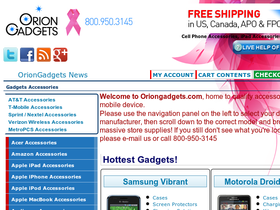 Shop Orion Gadgets onliine at OrionGadgets.com which carries quality accessories for your mobile device items. Orion Gadgets offers accessories for Apple iPad, Apple iPhone, Apple iPod, Apple MacBook, Audiovox, BlackBerry, Canon, Casio, Dell, Garmin, HP iPaq, HTC, Jabra, Kyocera, LG, Microsoft, Nextel, Nikon, Nintendo, Pantech, Plantronics and many more. Save on your next purchase from OrionGadgets.com with discounts, coupons, promotions and savings from 58coupons.com. Hurry on over to OrionGadgets.com to save up to 20% on the Latest Additions. Click link to view. Head on over to Orion Gadgets to save up to 15% on Monthly Best Sellers. Be sure to come back every month to save the most. Click link to start saving. Check out the hottest gadgets section on OrionGadgets.com to save up to 10%. Click link to view.